Foo Fighters frontman Dave Grohl will make an appearance on Sesame Street this season for the program’s 50th anniversary. 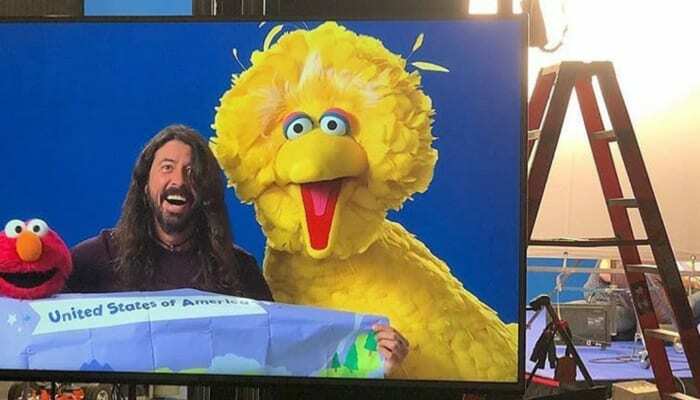 While we don’t know many details concerning Grohl’s episode just yet, we do know that he will be sharing some screen time with Big Bird and Elmo, as well as playing a song for them! “Dave Grohl was incredible. Thanks for playing with us! A great way to wrap up this week’s shoot,” Elmo’s current puppeteer, Ryan Dillon, wrote on his Instagram, while Sesame Street producer Aimee Blackton shared a photo of Grohl playing his guitar on set. Grohl has previously spent time in the Muppet universe, appearing on the ABC mockumentary-style series The Muppets in 2015, as well as making a cameo appearance in the 2011 film The Muppets, as a fill-in drummer for The Moopets cover band. Sesame Street will kick of its 50th anniversary in Feb. 2019 on HBO, with production already in progress. The season will run through December 2019, but it is not yet known when Grohl’s appearance is set to air. What do you think of Dave Grohl joining the Sesame Street crew? Let us know in the comments!